"Clearly lays out the complex images that the Ptolemaic observers derived from their observations." "Ptolemy Universe is a great tool for explaining the evolution from the Earth centric to the Sun centric view of the Solar system. Highly recommended!" "I suggest this app to all people who wants to study in history of astronomy or human thought during science evolution. If you are some one who wants to know what was the belief of ptolemy about universe, and what is the roots of modern astronomy; this app is for you." The Ptolemy Universe application for IOS Devices shows the solar system in two ways. The first mode where the Earth is the center of the solar system (geocentric view). The second, where the Sun is the center (heliocentric view). For each date, the position of each planet are computed very precisely. Touch how smart Greek astronomers were ! And understand the celestial mecanics through many animations. Ptolemy Universe app for iPad, iPhone and iPod gives you, with modern tools, an easy way to understand how the planets are moving around the sun. Ancient Greeks, looking at stars invented a model that gives, with a good accuracy, the position of the 5 naked eyes planets (Mercury, Venus, Mars, Jupiter and Saturn). Even if the Ptolemy system is false it gives a good approximation of the planets positions. 3) - what you actually see from earth, the planets moving in front of the 12 zodiac constellations: Fish, Ram, Bull, Twins, Crab, Lion, Maiden, Scales, Scorpion, Archer, Sea goat and Water bearer. 6) - the Ptolemy epicycle model simulation with an epicycle animation (understand equant, deferent and epicycles). 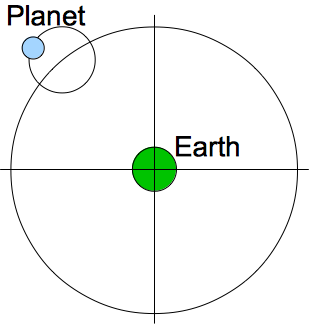 7) - the planets orbits using the Earth orbit as reference. Except for the last simulation, the planets positions are calculated using modern algorithms. This application, on the iPad is a perfect tool for education and for dome projection. Concerning dome projection it has been scaled to adjust to the video projection systems capabilities. It can be used as a tool for Planetarium exhibitions. Ptolemy Greek-Roman astronomer born 90, died 168 in Egypt. Ptolemy Planetary system present the universe as a set of nested spheres with the earth at the center of the universe. Ptolemy used the epicycles of his planetary model to compute the dimensions of the universe. The apparent motion of the heavenly bodies with respect to time is cyclical in nature. Apollonius of Perga (200 BC) realized that this cyclical variation could be represented visually by circles, or epicycles (mini circular orbits), revolving on larger circular orbits, or deferents. Deferents and epicycles in the ancient models did not represent orbits in the modern sense. The ancients did not know about orbits. 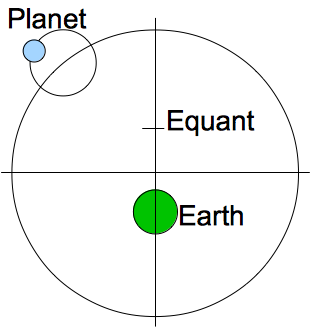 Claudius Ptolemy refined the deferent/epicycle concept and introduced the equant as a mechanism for accounting for velocity variations in the motions of the planets. The empirical methodology he developed proved to be extraordinarily accurate for its day and was still in use at the time of Copernicus (1473) and Kepler (1571). Ptolemy defined a useful tool for astronomical calculations in his "Handy Tables", which tabulated all the data needed to compute the positions of the Sun, Moon and planets, the rising and setting of the stars, and eclipses of the Sun and Moon.